What are the Leadership in History Awards? 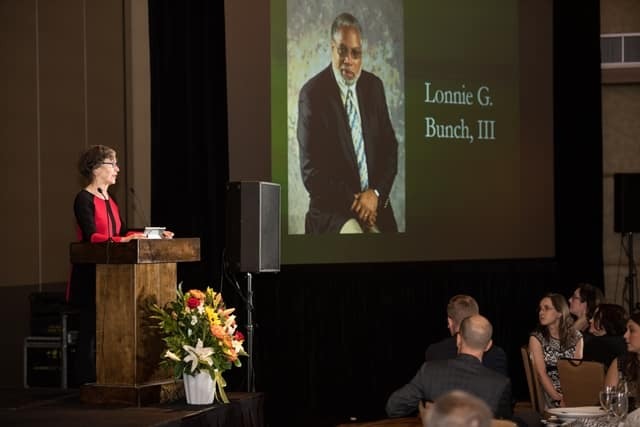 For over seventy years, AASLH has given Leadership in History Awards to establish and encourage standards of excellence in the collection, preservation, and interpretation of state and local history in order to make the past more meaningful to all people. 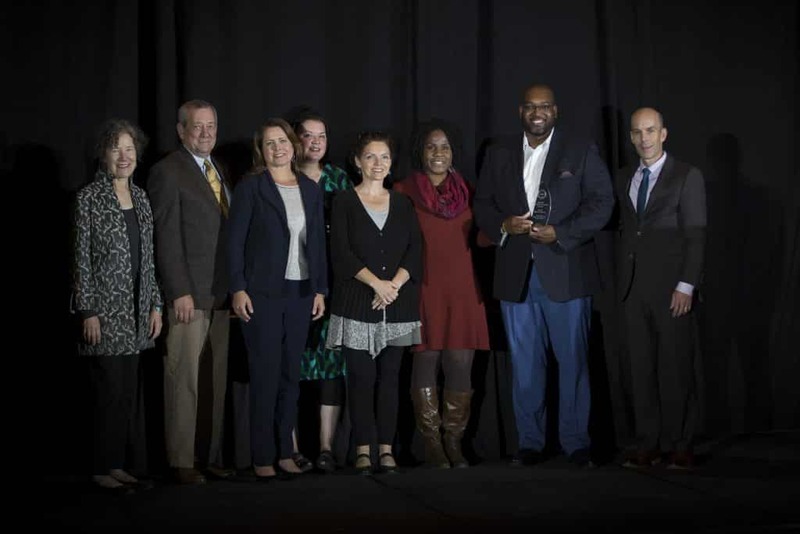 By publicly recognizing superior and innovative achievements, the Leadership in History Award winners serve as models and inspirations for others in the field. We offer awards for many different types of projects, including publications, exhibits, public programming, and more. Award winners come from all over the country, from organizations of all kinds, sizes, and budgets. Our awards program is non-competitive, meaning your nomination is not in competition with others for a finite amount of awards. Your nomination is evaluated alone on its own merits. We encourage nominations from small and all-volunteer organizations. This informational webinar will give you an overview of the program, as well as providing tips for submitting a nomination (54 minutes). What are the Different Types of Leadership in History Awards? The Award of Excellence is presented to recognize excellence for projects (including civic engagement, special projects, educational programs, exhibits, publications, etc. ), and individual lifetime achievement. This is the main award for which applicants nominate projects or people. The Award of Distinction is a higher level personal award given infrequently and only in recognition of long and very distinguished individual service. Recipients are noted for their contributions to the field of state and local history and are recognized nationally as leaders in the profession. To nominate an individual for this award, please submit a Preliminary Nomination by January 31. The Awards Committee may also choose to select candidates from the Award of Excellence winners for additional recognition. You do not apply for these awards directly. The Albert B. Corey Award recognizes primarily volunteer-operated historical organizations that best display the qualities of vigor, scholarship, and imagination in their work. Regional chairs may recommend any primarily volunteer organization that is nominated for the Award of Excellence. This is an award made at the discretion of the Awards Committee. The Awards Committee also presents the History in Progress (HIP) Award, a special additional award for an Award of Excellence winner whose nomination is highly inspirational, exhibits exceptional scholarship, and/or is exceedingly entrepreneurial in terms of funding, partnerships, or collaborations, creative problem solving, or unusual project design and inclusiveness. This is an award made at the discretion of the Awards Committee. 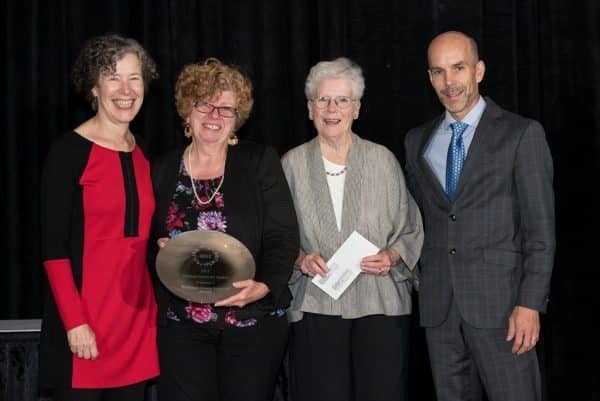 AASLH encourages organizations and individuals to nominate or self-apply for the national Leadership in History Awards. 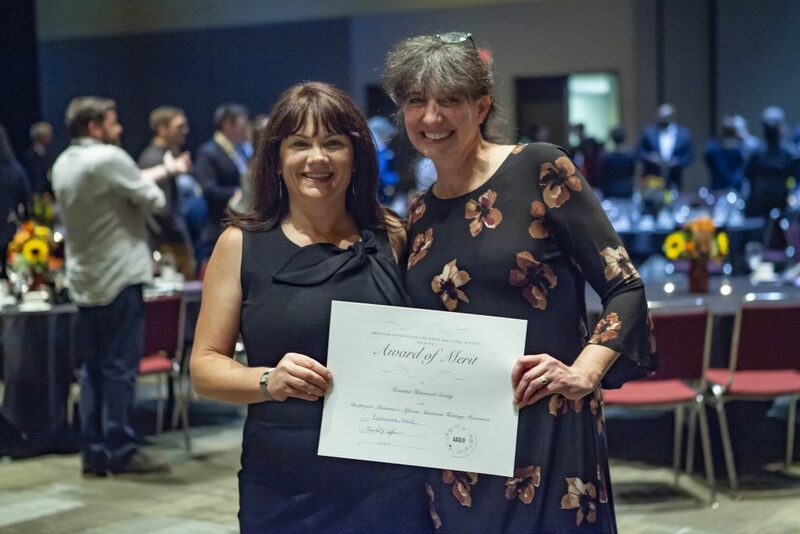 A nominee does not have to be an AASLH member to apply and self-nominations are encouraged (except for the Individual Lifetime Achievement category). It will take some time to gather the necessary materials for your nomination, so we recommend getting started a few months ahead of the March 1 deadline. 1. Contact your state or regional representative to discuss the nomination. 2. Read the awards manual so you know which materials to gather. 3. Submit your nomination form online. Nominations for publications need to send two copies of the book to their state or regional representative, but no other physical materials are required to be mailed. Note: You will need to create a unique user name and password to apply via the Submittable site. You can save and return to it to complete/review the form. After you have gathered your nomination materials, worked with your regional and state representatives to put together a great nomination, and sent everything to AASLH via the Submittable site, the evaluation process begins. Nominations are due March 1. From March to May, state and regional representatives evaluate their local nominations, provide feedback, and work with applicants to gather additional materials if necessary to strengthen nominations. 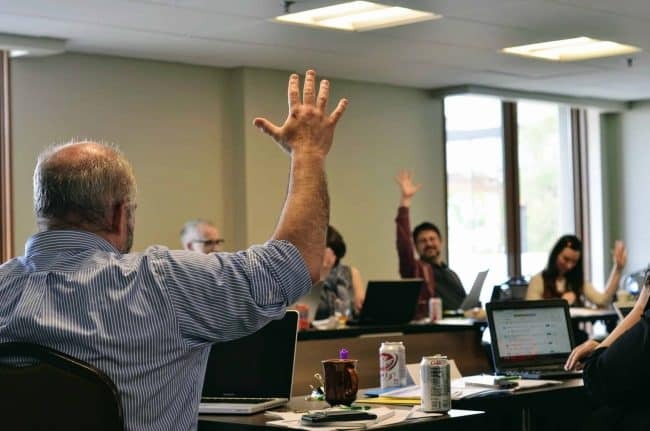 In May, the Awards Committee (consisting of 14 regional representatives, a national awards chair, and two members of AASLH staff) meets for three days in Nashville for the final evaluation. 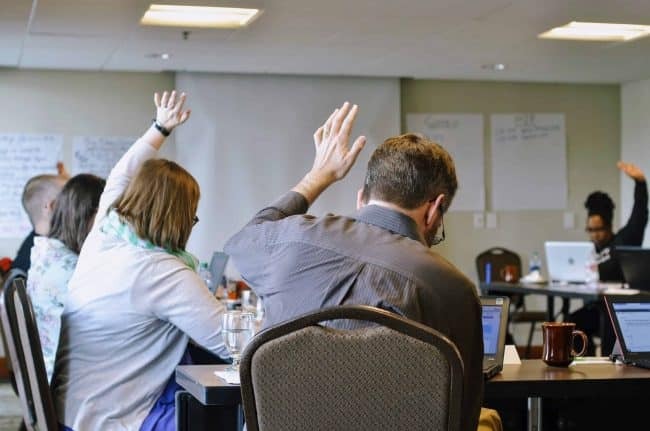 The committee discusses each nomination in depth, evaluates the nomination in light of AASLH’s requirements (see the tips page at left for more info), and determines the year’s award winners by majority vote. The committee may also choose to recognize select winners with additional honors, such as the History in Progress (HIP) award or the Albert B. Corey Award. In July, winners are notified of their award and provided with information they can use for local publicity. In August, the Awards Banquet at the AASLH Annual Meeting celebrates the year’s award winners. Worried your application isn’t competitive? Not sure how to get recognition at the national level? We’ve assembled these tips and sample nominations to help you get started and create a great application. Before submitting your nomination, be sure that you have read the 2019 awards manual, spoken with your state or regional representative, explored this site, reviewed the instructions and criteria for your type of nomination, and have looked at our examples of critical testimony letters. You can also read articles on previous year’s winners on our blog. We realize that you may still have questions, however, so please feel free to contact your state team captain, regional representative, or the AASLH office by phone or email. Don’t wait until you have a question to contact your state team captain or another AASLH representative—we encourage you to get in touch with them prior to submitting your notebook or even before starting the nomination process. Watch the free informational webinar “What are the Leadership in History Awards?” here. Be concise—extraneous documentation does not help a nomination. If you are uncertain on how much documentation to include, we will be happy to help you decide. Show us how your project demonstrates “good history.” Read the Awards Committee Statement on Good History for more information and examples. If you are uncertain who you might ask to provide critical testimony, contact your local college or university for suggestions or call a local museum or historical society. Remember, the individual must have professional expertise in the area of your nomination and cannot have been associated with your organization or the project. If you cannot find a qualified person locally, contact someone at your state level. Here is a document you can give to reviewers to let them know what AASLH looks for in a letter of critical review. Make certain that the qualifications of individuals providing critical testimony either are clearly stated in the testimony itself or in their CV/resume (which must be included with the letter). Items not considered critical testimony include: press releases, pre-publication reviews and commentary, letters of support from people involved in the project or elected officials, or other self-promotional material. For examples of the types of critical testimony we are requesting for each category, click on the links below. Make certain that your photographs provide a complete overview, showing all aspects of the exhibit or project. Please explore the entire awards site and contact your state and regional representatives to understand how to submit a quality nomination and how the review process works, but here are a few basic questions to get you started. Who is eligible to apply for an award? Members and non-members, big and small organizations, lots of staff or all volunteers, big, small, or no budget, museums, historic sites, libraries, and others, almost anyone is eligible to apply for a Leadership in History Award. Read the category requirements for more details on eligibility, but if you have completed a project or published a book within eighteen months prior to March 1, you are probably eligible. There are no staff size, budget, or location requirements. We encourage you to nominate your own organization for an award, but prefer that Individual Achievement nominations come from someone other than the nominee. What are our chances of winning an award? My organization is small and we have no budget! Our awards program is non-competitive, meaning your nomination is not in competition with others for a finite amount of awards. If we receive 100 great nominations, we will recognize 100 award winners. Your nomination is evaluated alone on its own merits, and is not compared to other organizations. We encourage nominations from small and all-volunteer organizations. What are judges looking for in an award nomination? Our awards committee looks for several things in a successful nomination. Does it satisfy all the requirements (no missing elements, fits within the timeline, etc.) for its category, does it make a contribution to the field of state and local history, and most important, is it “good history”? Good history embraces difficult history, acts to build diversity and inclusiveness, cultivates an experimental and creative spirit, demonstrates the relevance of history, and strives to be accessible to a wide audience. Read the Awards Committee Statement on Good History for more information and examples. Contact your state or regional representative. They will advise you on eligibility, category requirements, what materials to gather, and how to submit a great nomination. What do we need to submit for a nomination? Who should we ask for a letter of critical review? All nominations require two letters of critical review. These are letters from people not involved with your project in any way, who are qualified to judge the merits of the work. One letter should discuss the scholarship of the project, and should come from someone who has expertise in that subject (a professor, someone from another museum or organization, someone who writes about the topic, etc.). The other critical review should address the outcome and effect of the project on the organization or the community or constituency served. Examples of these kinds of reviewers may be teachers whose students toured the exhibit or representatives of a community that was served by the project. Reviews published in scholarly journals may be substituted for one letter of critical review. Local news coverage, press releases, etc., do not qualify as critical testimony. We discourage letters from local politicians, visitors’ bureaus, and others who may review the project for tourism potential rather than historical merit. If you’re having trouble finding a reviewer, ask your state awards representative for help. You can view sample critical letters of review for every category on the tips page at left. What kinds of publications are eligible for awards? The publication category includes books, journals, and other scholarly works focusing on state and local history. It does not include annual reports, brochures, newsletters, and other marketing materials. All publications must have full back matter (references and index). Publications should have a bibliography/works cited page and/or footnotes/endnotes. See our 2019 awards manual for more information. What about awards for long-running projects or programs? If your project has been going on for awhile but is reaching an important milestone, it may be eligible for an award. Contact AASLH or your state or regional representatives. Who Should I Contact About the Awards Program?